We are starting yet another month and here’s a delicious semi gravy chicken gravy that makes a great dish to be served with rice and chapati. When I come to think that even after 2k recipes that I must have on both my blogs, I still find a recipe that’s loved by all and yet not shared. Come to think of it, I am sure Amma has many such recipes tucked in. This recipe is something that Amma made a twist to her regular chicken semi gravy and everybody simply love it. We have been making this frequently, yet it never got shared here. I decided it was high time I made a note of it. As I always think, freshly ground masala tastes best for Non veg. Amma even grinds her ginger garlic paste fresh on Sundays when she ventures into non veg cooking. 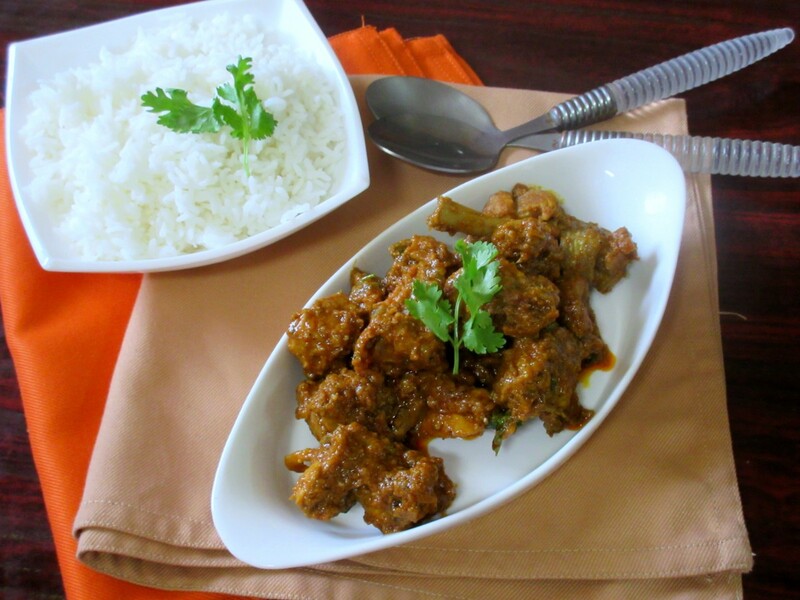 If you like variety, then this is a dish you must try, especially it being Amma’s signature dish. Talking about Amma’s cooking, I recently had a conversation with a friend from school, who was talking about the delicious food he remembers eating at our home, some nearly two decades back. I don’t remember the incident. However I was amazed he still remembers it so well, all because of the wonderful meal he had. Food really bonds people and sharing it makes it all the more bliss! Dry roast the spice powders and grind to smooth powder. Clean and drain the chicken. Keep it aside. Heat a thick bottom kadai, add whole spices, then add chopped onions, ginger garlic paste. Saute well. After 2 mins, add ¼ cup water and bring to boil, simmer and cook till the onions become translucent. Now add the drained chicken, saute well. Add salt and turmeric powder, mix everything and simmer till water comes out of the chicken. Next add Red chili powder and mix again. Cook for another 10 mins, making sure the bottom doesn’t get burnt. Now add coriander powder, tomato puree. Combine and cook for 10 – 15 mins. Water should get completely evaporated and the chicken nicely coated with masala. Then add the powdered spice powder and continue cooking with lid closed. This takes about 30 – 35 mins to reach this stage. At the final stage, add ½ cup thick coconut milk and simmer. Continue cooking with lid closed. Cook for another 10 mins, till the chicken becomes tender. chicken is completely cooked in a thick bottom kadai and has a very flavorsome aroma as it is slow cooked in the spices and its own oil. 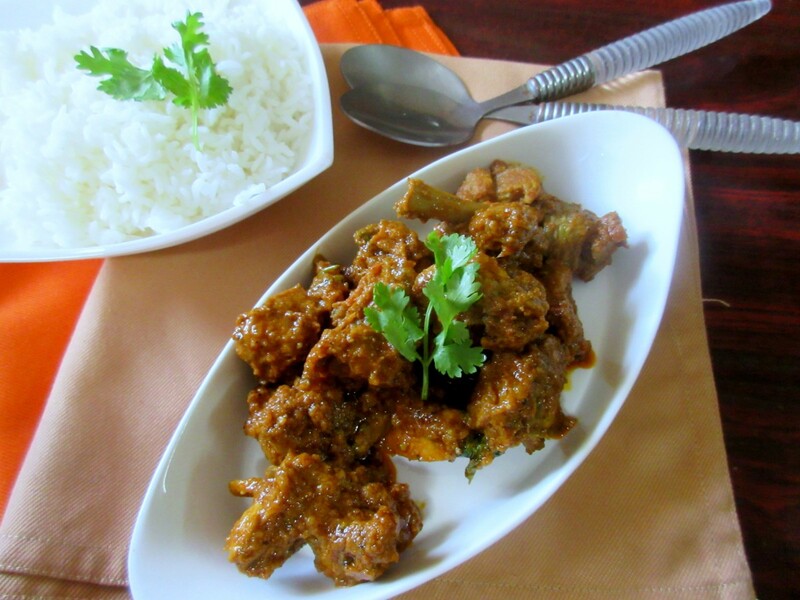 This Semi Gravy Chicken makes an excellent curry for both Rice and Chapathi. This goes for the November Week 1, Cooking from Cookbook Challenge Group. Your chicken sure looks delicious, Valli! !